Basically, break-even analysis determines the “break-even point”, at which operations neither make money nor lose money. At the break-even point, there is no gain or loss; hence costs or expenses are equal to revenues/incomes. Determining the break-even point for a business is the useful business planning tool. Fixed costs are those that remain the same regardless of sales volume or production. They are expressed usually in amount or rupees say Rs. 200,000. Rent, insurance, supervisory salary and real estate taxes are usually examples of fixed cost. Variable costs are those which change as sales volume or production changes. They are expressed usually as a percent of sold units like 8% of sales. Inventory, raw materials and direct production labor, for example, are usually variable costs. Profit is net of revenue from expenses. The state when revenues are higher side and expenses are in lower side is called profit. Ahmed, Inc. produces and sells a single product for Rs. 40 per unit. Costs are: variable cost per unit Rs. 30 and fixed costs Rs. 360,000. Using the profit equation determine the break-even point in units. >> Practice Multi-choice Questions and Answers Cost Volume Profit Analysis MCQs. Contribution Margin is the amount of money remaining after the variable costs of producing or purchasing is subtracted from the selling price. >> Practice More Questions and Answers Cost Volume Profit Analysis Problems and Solutions. A Company has fixed costs of Rs. 10,000 for this period. Direct labor is Rs. 1.50 per unit, and material is Rs. 0.75 per unit. The selling price is Rs. 4.00 per unit and normal sales is Rs. 24,000. Find the break-even point in dollars and in units and also break-even capacity? >> Practice More Questions and Answers Cost Volume Profit Analysis Problems PDF. Following data is extracted from Ali (Pvt.) Ltd. You are required to calculate the break-even in rupees, in units and capacity. The data shows sales Rs. 5,000,000 and per unit sale price Rs. 4. Break-even point can be obtained by Graphical Presentation. Following steps used for graphical presentation. 1. Draw X-axis for volume of sales or units. 2. Draw Y-axis for cost and revenue. 3. A line is drawn on the graph for sales revenue. This is zero when sales unit is zero. It rises in a straight line. To draw the revenue line, you therefore need to plot one more point on the graph and join this to the origin of the graph (x = 0, y = 0). 4. Draw Fixed Cost Line. It cuts the Y-axis at the amount of fixed cost. 5. A line is then drawn for total cost. To do this, we must add variable cost to fixed cost. When sales volume is zero, variable costs are zero, so total cost = fixed cost only. To draw the total line, you therefore need to plot one more point on the graph and join this to the fixed cost at zero sales volume (x = 0 and y = fixed cost). 6. 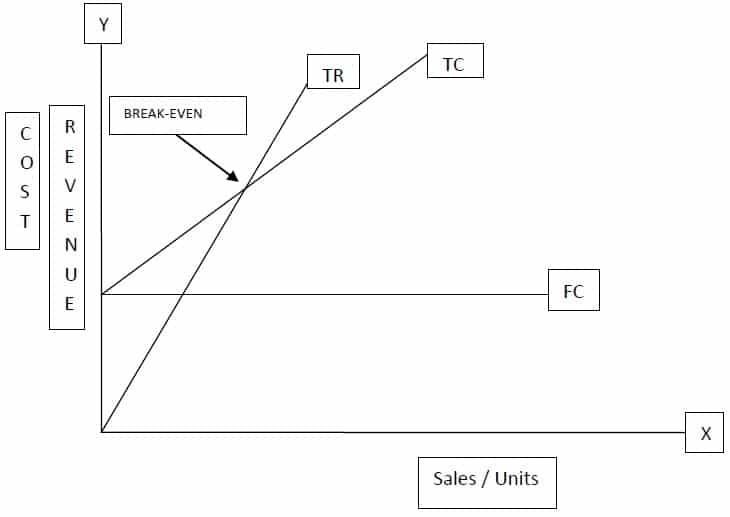 Total Cost Line intersect the Sales Line at the point of Break-Even. >>> Practice More Questions and Answers Cost Volume Profit Analysis Problems and Solutions. Actual sales volume may not be the same as budgeted sales volume. Actual sales may fall short or exceed to budget. The difference between the budgeted sales volume and the break-even sales volume is known as the margin of safety. It usually expressed as a percentage of budgeted sales (100/Budgeted Sales*Margin of Safety). >> Practice Cost Volume Profit Analysis Quiz 1 and Quiz 2.